1640 FM 423, Frisco Tx-75033. (10am to 9pm) Located conveniently at intersection of FM 423 and King rd. Be the FIRST SHOPPER! Enter this competition now by sharing our West Frisco location’s Grand Opening Post on your Facebook wall! India Bazaar West Frisco is all set to open it’s doors to the shoppers. With this great news comes an exciting opportunity for all our shoppers too. You can get a chance to be the FIRST SHOPPER of this amazing new location along with a a $50 India Bazaar gift card. How can you enter the post sharing competition? You can enter this competition by simply sharing our facebook competition post on your wall, any page or/and group you have. when will be the winner announced? On April 15, 2019 with the help of a special software we will randomly select the winner of this competition and share it on social media and our website. What do I win and how do I get it? 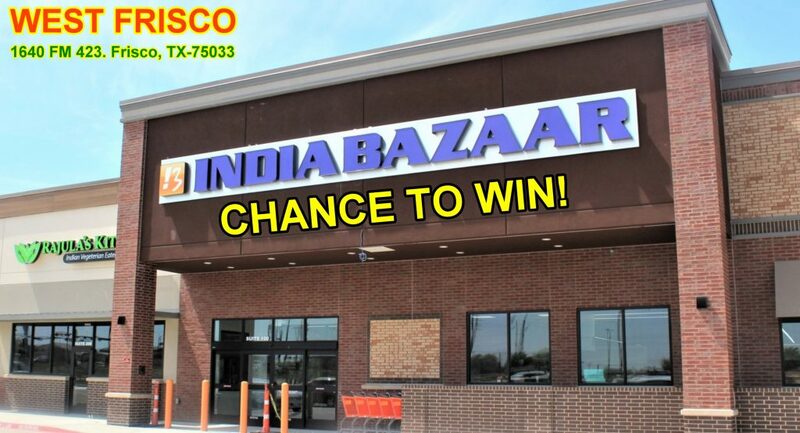 If you win this contest then, as a reward for this you will be the very first shopper for the India Bazaar’s West Frisco location. You will be India Bazaar’s star for that day. Plus, you can collect your $50 India Bazaar gift card the very same day too. Disclaimer: The person entering the competition must be 18 years or older. The participant must be an India Bazaar’s rewards card holder. The gift can only be collected from the West Frisco location. The participant has to be present on the morning of the opening day at India Bazaar’s West Frisco location to be the first shopper of this location. The person gives us rights to share his picture/video on our social media pages, facebook live, website and other medias. Gift card can be used at any location. Gift card cannot be used for cash redemption.